A blending of mustard, ketchup, and vinegar come together in a strong and harmonious balance that's equally unique and delicious. You know you're doing something right when you're most commonly known as "The Legend." That's the handle given to Mike Mills after becoming one of the most winningest men on the competition circuit in the 1990s under the team name Apple City Barbecue. But Mike not only knows how to churn out award winning smoked meats, he's also cemented as a barbecue icon thanks to his restaurant, 17th Street Barbecue, that is a pillar of Southern Illinois barbecue. Today, Mike continues his barbecue tradition in his two Illinois restaurants along with a couple more in Vegas under the name Memphis Championship Barbecue. His daughter Amy is also keeping the family tradition alive by running her own barbecue consultancy business called On Cue. Together they've also authored two cookbooks and host Praise the Lard, a competition that takes place in their hometown of Murphysboro. This sauce greets your nose with a very pungent and acidic aroma. That pungency is coming from a strong mustard component whose power is dialed back a bit by a less dominant sweet tomato, ketchup-like smell. Behind these major players sits an earthy pepper aroma that also brings a distinct heat to the sauce, imparting a slight hot sauce character too. This smooth sauce has a rusty orange hue and semi-glossy sheen. It's mostly opaque, but you can still easily see a lot spices that are mainly small specs that come in white, orange, red, and black. 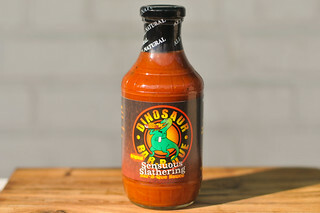 The sauce has a medium-thin consistancy and falls in a very fast, even, and watery pour off of a suspended soon. Once almost all of the sauce has left the silverware, a few quick drips release before stopping and leaving a thin coating of sauce clinging. 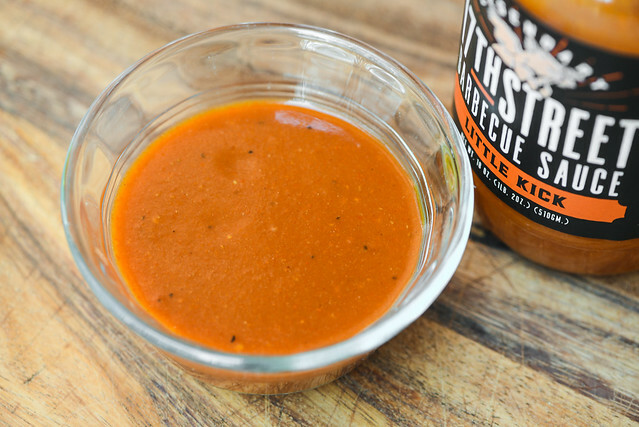 The first taste of this sauce is somewhat nondescript, but as it starts to settle on the tongue, an equal mix of mustard, ketchup, and vinegar start off a strong barbecue sauce profile. The tanginess at first is kept in check by a layer of sugars, but as the sauce lingers, the vinegar ramps up, along with chilis, to give the sauce a slightly smoky and earthy character with a touch of heat. While all of this is happening, there's even more added complexity by way of Worcestershire, which melds very well all of the other ingredients. Then, right at the end, both the tartness and heat levels increase and leave a mouth tingling burn when all is said and done. This sauce coated the chicken in a thin and even matter, baking down over direct heat to what looked more like a dry spice coating than sauce layer. There was some burn off over direct heat, and because of that, the sauce coating looked even drier, so I applied one final brushing before taking it off the grill. 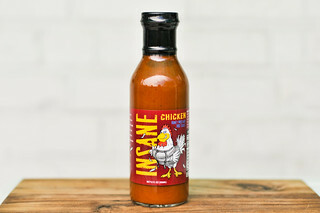 Unlike most sauces whose sugars become more prominent once cooked, it was the heat that took center stage after coming off the flames. The mustard pungency and chili burn were front and center, giving the chicken a lot of flavor for what looked like a light coating of sauce. After a few bites, the sugars became more pronounced and brought some balance to the heat, along with a little extra help from the ketchup. Once the leg was finished being eaten though, what was most memorable was the spicy tingle that remained imparted on the lips. 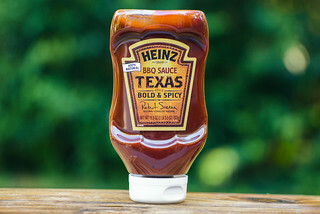 It's usually the case that barbecue sauce either features tomato or mustard, with the other one either omitted or playing a smaller supporting role. This sauce, however, gives equal billing to both, and add to that a nice hit of heat, hearty tang, and complex Worcestershire, and you have one really tasty sauce. Out of the jar everything felt balanced and in harmony, and I was all to happy to have one spoonful after the next and thought of how this would be great on some smoky pork, burgers, brisket, etc. 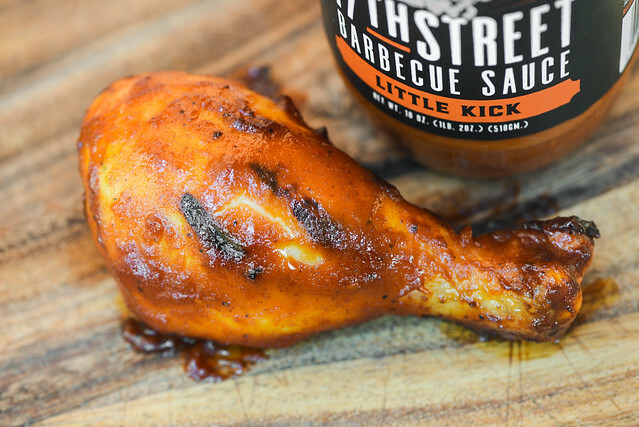 After being grilled, the sauce lost some of its moisture and saw an increase in heat to make a flavor I also really enjoyed on the chicken, but can imagine the absence of sweet stickiness may not be best for all barbecue applications or tastes. 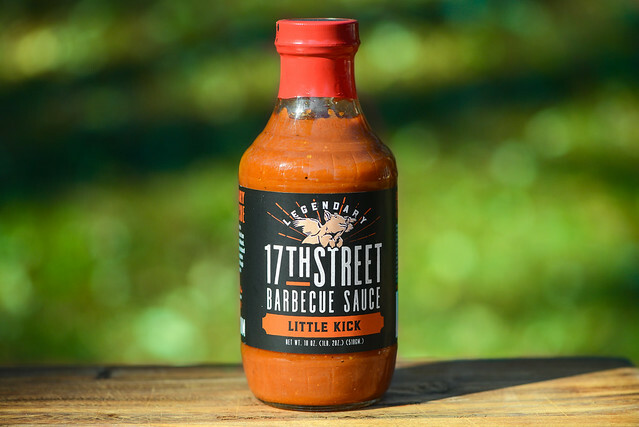 This was my second 17th Street sauce that impressed me a lot, so I can't wait to see what the next two I still have to try out have in store.